The ultimate guide to Scheffau ski holidays in 2019 & 2020. 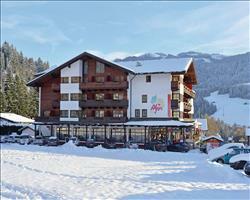 The smallest of nine SkiWelt resorts, pick quaint and quiet Scheffau if you need a proper getaway. Spend your days roaming Austria’s biggest lift-linked ski area, followed by leisurely evenings of good food, Glühwein and getting to know the locals. On the south-west side of the staggering Wilder Kaiser mountain range, this pretty village is Austrian through and through, with two lovely old churches and classic chalet-style buildings housing family-run restaurants and gasthof’s. The surroundings are spectacular, with glorious winter walking routes leading through trees and past frozen alpine lakes. Though it feels far, far away, you’re no more than an hour’s drive from Innsbruck airport, and a fraction longer from Salzburg. The taxi from Wörgl train station usually takes less than half an hour and it’s also possible to catch a bus if you don’t mind a slightly longer journey. Besides the obvious lack of loud bars and nightclubs here excellent ski schools, easy skiing back to the village and on-mountain childcare services make this a super place to bring the brood for a first ski holiday. You’ll also find some fantastic four and five star spa hotels - perfect for couples after a quiet escape to the mountains. Then there’s the skiing, which unlike the village is enormous - hop on one of the village gondolas and you’ll find yourself transported directly into the SkiWelt Wilder Kaiser-Brixental, the biggest interconnected ski area in the country with a terrific network of scenic intermediate skiing. View our detailed Scheffau snow forecast or snow report and see all live webcams, piste maps, road and travel maps and lift pass prices. For a picture of historic snow conditions see the snow depths month by month with our Scheffau snow history. The resort’s home to 3 nursery slopes: pistes 77 and 78 at the top of the Brandstadl gondola, and no. 79 found just on the outskirts of the village. There’s a beautiful return back down to the resort (piste 61), which beginners who’ve conquered the basics will love. To keep more competent beginners entertained, you’ll find a wide array of blues around top of the Brandstadl. Intermediates are fantastically catered for here - venture slightly higher up to the Eiberg peak, which is surrounded by some wonderful chair-lift served red pistes. There’s a special treat in store for anyone skiing the red ‘Südhang’ slope (no. 66), AKA the ‘SkiWelt Ski Movie’ run. The kind people at SkiWelt have teamed up with BMW, to bring a slalom course to the slope, on which you’ll be filmed zooming down. Cross the finish line, then simply download your movie using your ski pass number, or relive the action at the Skiline terminals at the top of the Brandstadl or Hochbrixen lifts. Any advanced snow lovers shouldn’t let all this talk of reds and blues put them off. The acclaimed Moderer route (no. 63) is a perfect way to finish your day with a return down to the resort, with great powder up at the top, followed by a challenging mogul field. The Tanzbodenbahn slope (99) is home to Intersport Kaiserpark – or more simply, a great place to try out some tricks and flicks on their flatrail, wallridespine, butterbox and tables to name but a few of the obstacles here. The village’s small size gives it a homely Tyrolean feel, which is well conveyed through the selection of bars, restaurants and activities on offer here. The Stern Bar’s Red Bull tent at the bottom of the Brandstadl gondola is the loudest watering hole you’ll come across in this neck of the woods – Austrian après ski as we know and love it with big events seeing dancing on tables and copious amounts of Jägermeister. Back in the village the atmosphere’s laid back and friendly. The Village Pub does just what it says on the tin - the lovely Hoeck family always give a warm welcome with good beer, music and Wi-Fi. Many of the hotels (we like the Waldhof) also have bars which are perfect for a chilled-out drink, moments from your bedroom. The restaurants here specialise in traditional Tyrolean cuisine, which includes knödeln (dumplings to you and me) of all different sizes and flavours – look out for kasspatzln on the menu for a real cheesy treat. Head to the Brandstadl to try Austrian cuisine, or alternatively, for a decent pizza go for the Donatello Ristorante. For anyone who hasn’t satisfied their craving for snow activities by night time, cross-country ski enthusiasts will be delighted to hear that a similarly well-lit 2km trail is open ‘til late. For something more relaxed and romantic, there’s often a guided candlelit walk through the woods in the evening, where you’ll be welcomed by a warming glass of Glühwein at the end. When is the best time to ski Scheffau? Scheffau’s often said to have some of the best snow in the SkiWelt thanks to the north-facing Brandstadl and Eiberg areas, which tend to hold the white stuff quite well. The SkiWelt area has a gobsmacking 1700 snow cannons on over 200km of piste, meaning extra cover can be provided whenever Mother Nature needs a helping hand. As it’s a smaller, lesser known resort, the local runs often remain lovely and quiet, with high-quality lifts keeping queues to a minimum on busier weeks. If you have kids that are eager to learn to ski, look no further than Scheffau. Just one look at the piste map will give you an idea about how great this resort is for learners and beginners, with a web of interconnected blues at the top of the Brandstadl gondola, as well as nursery slope #79 just on the outskirts of the village. On these gentle slopes you’ll find the Pepi penguin club, where your kids will not only learn how to ski, but have the time of their lives whilst doing so. Even little ones who can’t ski are well looked after, as the capable Pepi childcare services will keep them well entertained. Daredevil kids who love a trick or two can be kept busy in the Intersport Kaiserpark, found at the top of the Tanzbodenalm slope (#99). If you want to get your skis on as soon as possible, Land Hotel Alpin is very helpful to avoid long walks to the slopes, as skiing straight down to the gondola is possible in normal conditions. Book a package with us, including flights, accommodation and transfers for a worry-free holiday and of course great value for money. Leave all the legwork to us, and we’ll let you start looking forward to seeing your kids’ delirious smiles as they ski for the first time. Alternatively, if you’re planning on a self-drive or independent travel holiday, we also have some great hotel only deals for you. Despite the resort’s small size, it is still able to cater to groups of any size who are more focussed on the amazing skiing than a buzzing nightlife. The wide range of terrain, from nursery slopes (labelled 77-79 on the piste map) to challenging mogul runs (63) will keep everyone in the group happy, no matter the ability. Schools like the Pepi penguin club are a great place for any youngsters to learn how to ski, whilst non-skiers can also be kept entertained with activities like tobogganing, horse-riding or trips to Salzburg. After a day either enjoying the slopes or taking in the Austrian history and culture, meet up with the rest of the group in the Sternbar Red Bull tent for a drink and recount the day’s adventures. The resort’s sizeable hotels, like the Hotel Kaiser or Land Hotel Alpin are more than capable of accommodating large groups, as well as often being a safe option in case of last minute stragglers who decide late in the day to tag along on the holiday. If you want the best value for money, look for one of our packages including flights, accommodation and transfers, leaving you time to sort out the important things to prepare – like what colour ski jacket you’ll look best in zooming down the slopes? If you’ve already got that important decision out of the way, and are happy to organise self-drive or independent travel, go for an accommodation only booking and we’ll be happy to help.